I’m a little bit in love with the new Avon Pro nail varnish. I blogged about it a while back, but the more I use it the more I think it’s the best range of polish I’ve found in a long time. The colour range is fab (it has everything from classic reds to funky oranges and pastel summery hues) and includes a vast range of effects (including matte, shimmery, metallic and classic shine) to suit every mood. You can play around with the shades because the formula is so flexible, applying like a dream and lasting for days on end. I’ve hardly used another brand in the last month and when I have it’s been removed in favour of Avon within 48hrs. A must for any nail lover. 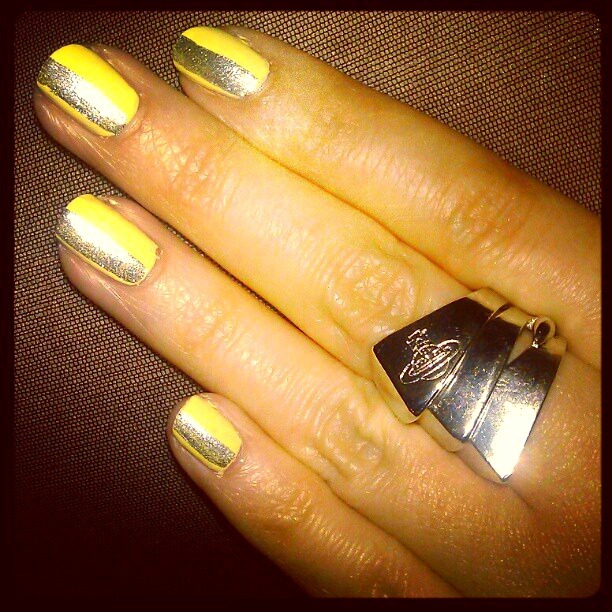 I’m wearing ‘lemon’ and ‘starry sky’ available here. The ring is a fake Vivienne Westwood from eBay! This is really cool I love what you did with the gold!